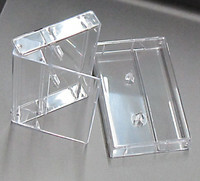 NEW wider glue flaps for easier assembly. 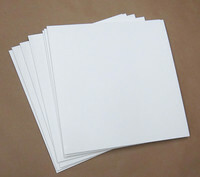 Uncoated white board, not assembled, 12 inch jacket flats. These jackets are die cut, scored, and ready for you to try printing and your own assembly. Includes a spine. Made with premium 18 point Carolina board, die cut so the uncoated side is facing out, and glossy side is on the inside. great product, quick service and easy to order online. thanks!